‍Surrey, B.C. 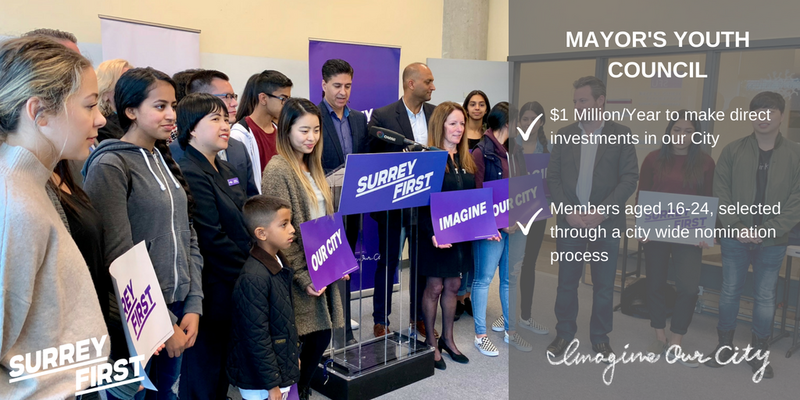 (Sept 24, 2018): Surrey First mayoral candidate Tom Gill and his team will create a Mayor's Youth Council if they are elected October 20, ensuring Surrey's youth have a "real say" in the future of their city. Gill said today that he wants young people in Surrey to be fully engaged when it comes to issues that impact the kind of future they want for themselves and their community. Gill said he wants to have the initial 10-member youth council in place by March and will call for youth council nominations from across the city. The Mayor's Youth Council would have a yearly budget of $1 million, part of the five-year $30 million public safety plan Gill introduced earlier this month that includes both intervention and prevention programs for Surrey youth.